HELLO! COME WITH ME ON A TRIP OF A LIFETIME! My name is Michael and I would like to share with you the four week circle trip I made in western Canada and the United States. There were many highlights and some great memories. I hope I can give you some ideas for your next trip! Thank you to Marcel for being my virtual tour guide! Today at 10 o'clock I started my roadtrip from here in Canmore in the Canadian Rockies. My first stop was Manyberries, which is a very small town near Medicine Hat in southern Alberta. In Manyberries I visited a Swiss rancher. 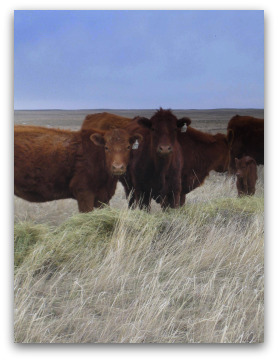 Ernst works on a ranch with around 1500 head of cattle. Ruth, his wife, made a wonderful dinner - New York steak with risotto. Yesterday I thought that I would stay one more day on Ernst and Ruth's ranch. After a very nice breakfast I went with Ernst to feed the cattle in the field. I was impressed by how big it was. We drove by tractor out into the field and there I saw around 800 cows with their calves. In the afternoon I helped Ernst take down a large fence. We went out to eat in Manyberries and I enjoyed my dinner at the little saloon in town. We then went home to the ranch - I was really tired from taking down that fence! After a very good breakfast (even with a "Zopf" - Swiss braided bread), I started my trip to the United States. On the border there was a very muscular-looking customs officer - who incidentally was very friendly! I would recommend being relaxed and always tell the truth - then you won't have any problems. I gave my fingerprint and entered the US. I was very surprised that they didn't check my car. I drove a long way - a very long way. My initial plan was to drive all the way to San Fransisco. I changed my mind because I am after all driving alone and that was just too far. I decided to drive as far as Ennis which is a small town near Yellowstone National Park where I stayed the night. From Ennis I drove to West Yellowstone where there is a western entrance to the national park. I personally think that Yellowstone is the best park I have ever seen. I was fascinated by the buffalo and many elk. 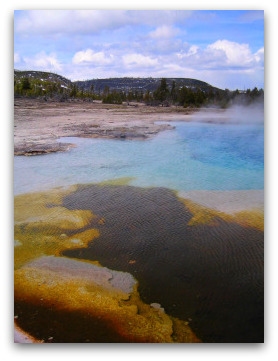 I also saw numerous hot springs and geysers for which Yellowstone is famous. I found them not only beautiful but very impressive. I decided to spend the night in a motel in West Yellowstone. My original plan was to stay one more day in Yellowstone National Park but surprise, surprise - overnight we had received about 30 cm of new snow!! 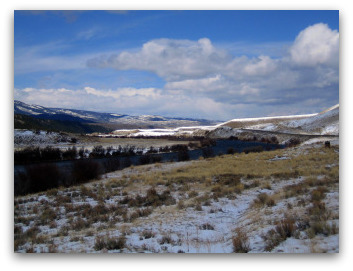 The weather just wasn't very nice and so I started my car and decided to drive to Fairmont Hot Springs Resort which is situated close to Butte, Montana. I relaxed for an hour in a hot pool and then started my trip over the Rockies to Coeur d'Alene. The road conditions were really not very good and it was so windy. I would recommend staying longer in Yellowstone National Park if the weather is good and time permits. 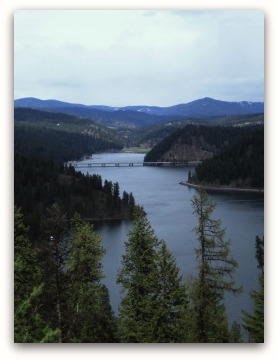 Coeur d'Alene is a wonderful place in Idaho with a beautiful lake. For me it is comparable to Monaco. I found the downtown very clean and the people friendly. Just by the visitor center there is a small hill called Tubbs Hill with various trails. You can take these trails around or to the top of Tubbs Hill. If the weather is nice, you could even take a break on the beach. At noon I took a cruise on the lake for two hours and discovered the many different places the lake had to offer. I saw a lot of nice houses and many resorts with great gold courses. In the afternoon, I drove from Coeur d'Alene to Harrison, which is a small town by the lake. "Lake Drive" was very nice but I didn't get a chance to take a lot of pictures because of the weather. When the weather is good, you can take a lot of pictures and take advantage of the wonderful panoramas. 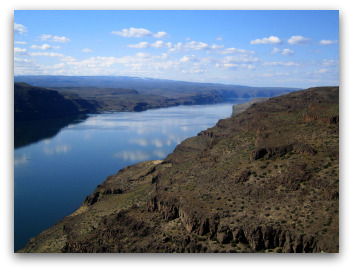 After a four-hour long trip from Coeur d'Alene to Seattle, I was very tired and called it a day. Today I started the day with a 30 km trip to Everett, just outside Seattle. I decided to visit Boeing and go on a Boeing Everett factory tour! Boeing builds airplanes for customers all over the world and it was so interesting to see just how these planes are made - and how long it takes to make them! You can see the airplanes at various stages of assembly - personally, I think this Boeing tour is a MUST! 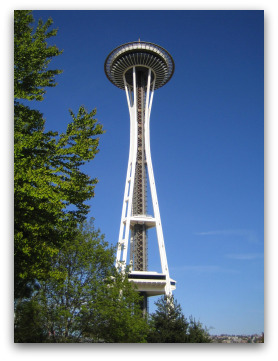 In the afternoon, I drove back to Seattle and decided to visit the symbol of Seattle - the Space Needle. It was built for the 1962 World's Fair, and has become quite a tourist attraction with an observation deck 520 feet (160 m) up in the air(!) and a rotating restaurant. I went to the top of the tower via an elevator and once at the top - I just had to get my picture taken! What is the view like? I saw a very nice city - a city with more character than Calgary, I think. After that I went to visit a houseboat that was free to view. It is really nice for doing nothing but relaxing! While on the boat, I spoke with some people who were from Seattle. They told me I should take the ferry to Vashon Island where there is a nice youth hostel. I was really lucky that these people told me this information because my original (not so good plan) was to drive all the way around Seattle to Port Angeles. At 6 o'clock I started my trip to Vashon Island. I took the ferry in Fauntleroy (which is by California Street SW) and was on Vashon Island in no time. 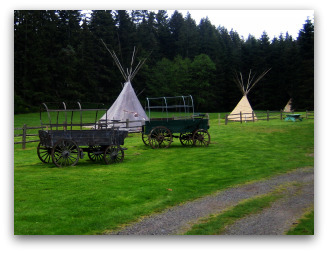 I went to the AYH Ranch Hostel where I decided I would sleep in a teepee that night. The night before in Vashon had been the Season Opening and there was a party atmosphere in this small town! I went out for dinner at a restaurant and enjoyed some really good seafood. At 10 o'clock I started my trip on Vashon Island. I took the ferry to Bremerton and then I drove to Port Angeles. Tomorrow I will take the ferry to Canada. It had rained all day and I wanted to take pictures from the beautiful roadway along the sea. I thought how lucky I had been to meet these people who told me about Vashon. Instead of driving all the way around Seattle, I had a nice shortcut with a lot of nature! In the morning at 8:20, I took the Coho ferry from the USA to Canada. At 10 o'clock I was in Victoria and back in Canada again. 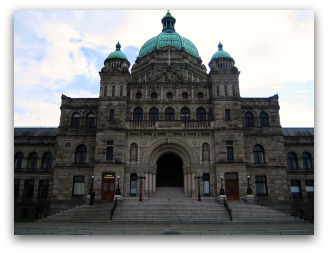 I parked my car downtown and went to the Royal BC Museum to see what they had to offer. It was very interesting: they had just opened an exhibition from the British Museum "The Treasures of the World’s Cultures" bringing artifacts from all historical eras and from all parts of the world to Victoria. I also enjoyed the First Peoples Gallery which shows what the First Nations cultures were like before and after the Europeans came. This I found personally more interesting. You really learn a lot about the native culture and how they lived. Then it was time for my lunch break. I decided to go to Victoria Harbour - what a beautiful place. Around 2 o'clock, I went back to the Royal BC Museum to view the Natural History Gallery, which shows the ever-changing environments over time in beautiful British Columbia. I would really recommend that you take the time to visit this museum - it was really great. I think you need at least 4 hours for the Royal BC Museum. I spent the night at a backpackers hotel in downtown Victoria. 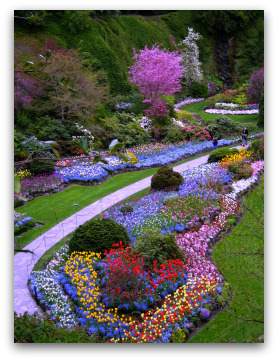 For the next day I had plans to go to the famous Butchart Gardens. At nine o'clock I started my trip to Butchart Gardens. What started as a limestone quarry is now 22ha (55 acres) of floral magic. The various gardens are amazingly beautiful. The flowers are so colourful right now (spring) and it was a wonderful experience. I must say that Butchart Gardens are the best gardens I have ever seen with tulips and roses blooming in all different colours. This is also a MUST-SEE on any trip to Victoria and you should plan to stay about 4 hours to really experience this special place. From Butchart Gardens I drove to the ferry which took me to Salt Spring Island where I stayed overnight in a cozy little cabin. After enjoying some peaceful time on Salt Spring Island, I boarded a ferry to Crofton. 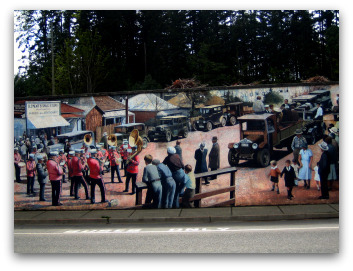 I then stopped off in Chemainus, a small but very nice little town, famous for murals which are really works of art. I spent about 2 hours just walking around and gazing at the 41 different outdoor murals which tell the history of this little town. There are also carvings and statues to admire. From there I drove to Courtenay where I stayed with a friend for two nights. Because of the rainy weather, I decided to go to Campbell River for the day. I relaxed there and made a trip to the laundromat! At 10 o'clock I took the ferry from Comox to Powell River. I then drove from there to a place called Lund. What brought me here? 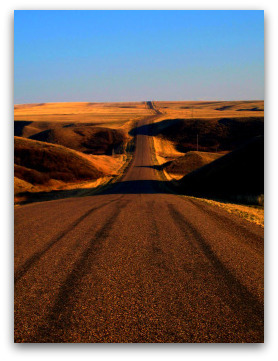 Lund is the last town on what is said to be the North America's longest roadway, Highway 101. Also known as the Sunshine Coast Highway, this roadway goes from Lund, BC all the way down to Mexico. I spotted some fishermen and went over to talk to them. 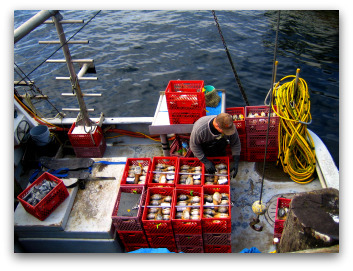 They were fishing for something really special - and expensive - geoducks. Pronounced "gooey duck", this Asian specialty is really a large saltwater clam and is said to have a nice flavour and a crunchy texture. I then drove back to Powell River and stayed overnight at a motel in Powell River. Yes, I'm really happy that the weather on the Island was really bad! My plan today was to do a guided kayaking tour today. At 8:30 we drove from Powell River to Lund. In Lund, my guide gave me instructions on kayaking. We kayaked to different small Islands which are famous for their starfish (seastars). 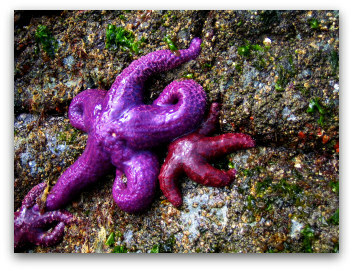 An example of a starfish is the Sunflower Seastar - which happens to be my favourite! When we were kayaking, we also saw seals and many eagles. It was really amazing to see what nature is like out there. My guide explained a lot of things to me about the trees and the birds, for example, and it was so interesting to see and learn out there in nature. I would really recommend going on a guided tour in an area that interests you. It is fun and you learn a lot. After an 8-hour trip, I was tired - but I think kayaking is easier than canoeing and as a result, I found it very relaxing. FOR PART TWO OF MICHAEL'S FOUR WEEK CIRCLE TRIP - JUST CLICK!